After yesterday's accidental encounter with a bald eagle, we set out today with the intent on seeing some more bald eagles. We had read that the Skagit River is a good place to spot eagles, so we headed for there. Surprisingly, we ended up seeing a bald eagle long before we even got to the Skagit River. After just a few minutes on the highway, we saw a bald eagle swooping and diving while being harrassed by crows. That turned out to be a very good sign, for when we got to aptly named Eagle Creek (off of Route 20 along the Skagit River just north of the town of Concrete), we saw about 8 or 9 bald eagles! We hung out along the river bank for a hour or so, trying to get some good pictures. 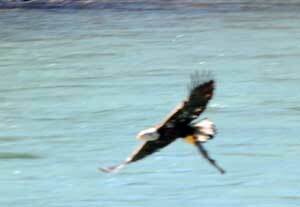 At one point we even got to see an eagle catch a fish. I managed to get a picture, but it's a bit blurry. Rob took some much better pictures. Hopefully he'll post some on his site here. Below is my blurry picture. I also saw a rather large bird gliding overhead. I'm not sure whether it was an immature bald eagle or some other species (perhaps an osprey?). It sounds like a great trip! 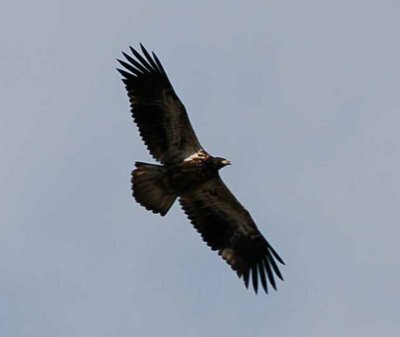 After consulting a book,(Silbey Guide) I can tell you that the bird was definitely a juvenile bald eagle, probably a first year. They don't get adult colors until they're three.